Not every one can afford a new motorhome but of course, that does not mean they cannot enjoy holidays or longer sojourns on the road. There is an abundance of suitable pre-loved motorhomes and caravans that will do the job very well indeed. 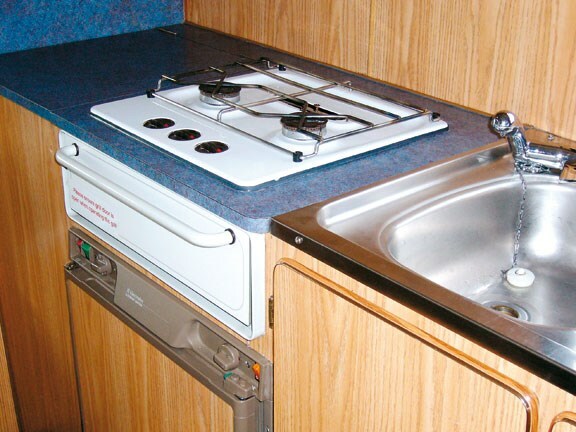 In motorhomes, the range starts around $35,000 for a very basic, older unit. Caravans are much cheaper because they do not have engine component. This month I talked to Kerry Congdon, the managing director of second-hand dealership, Leisure Vehicles, in Albany. 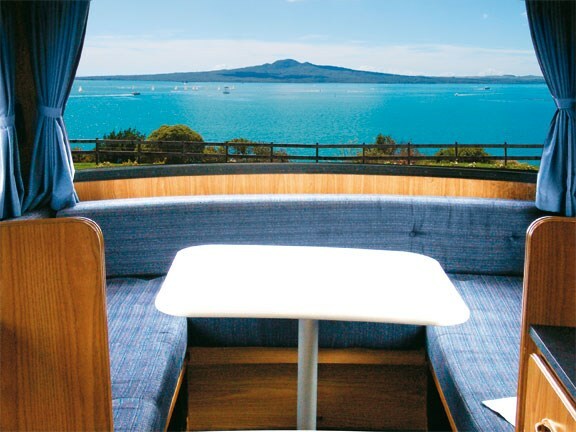 He said that of the motorhomes he sells, the Ci Munro-built, ex-Pacific Horizon rentals that are constructed on Mitsubishi Canter truck chassis are the most popular in its price range. The one I looked at was selling for $73,000. 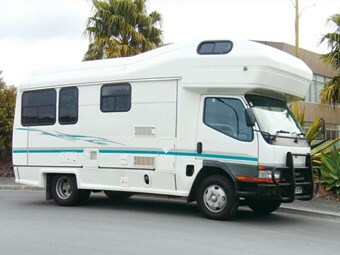 It was a 2002 four-berth, built on a long wheelbase and 5.8 metres in length. 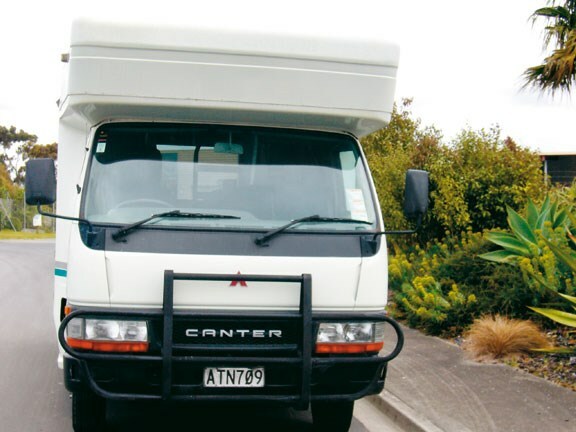 One big plus is that it is a good-sized vehicle that can still be driven on a car licence. Inside there was plenty of space and light and considering its age, it was in good pretty good condition throughout. The wood paneling was scuffed in parts and the design was obviously not the most modern, but the upholstery and surfaces were in good nick. At the rear of the home is a large, very comfortable, U-shaped lounge, which is surrounded by large picture windows. A small hatch above this area also adds light. The lounge seats convert into a generous-sized double bed and there is also a good-sized double bed in the luton. 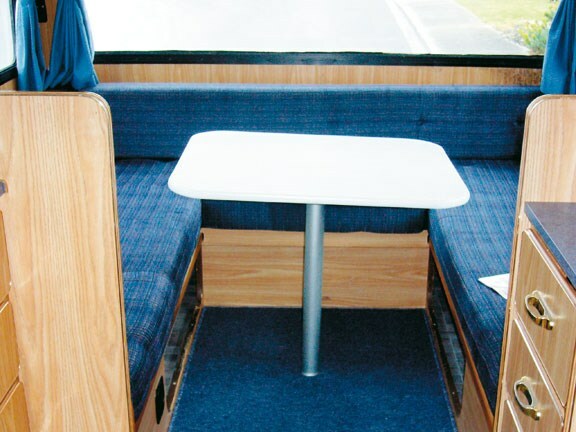 This means that if there only two people sleeping in the motorhome and you don’t want to set up your sleeping arrangements each night, the luton bed would be quite comfortable as a permanent sleeping space. The only thing that is not so comfortable is climbing the fixed metal ladder to get into it. 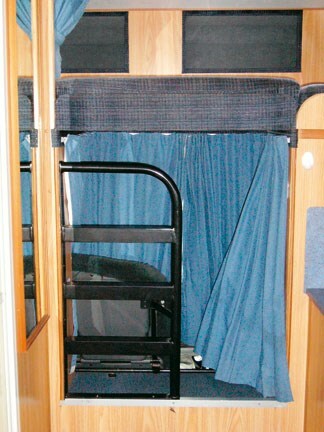 This motorhome has plenty of good cupboard space – six deep storage lockers over the lounge seating for a start and two "suitcase" lockers under the setee. The kitchen also has a lot of deep, easily-accessed cupboards and six drawers. 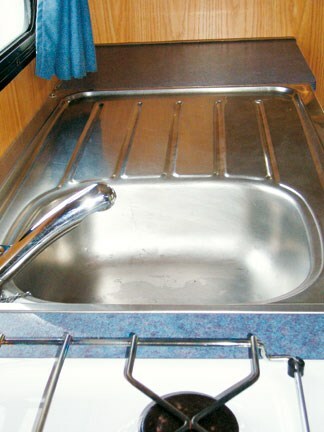 It also has a decent amount of bench space (the first thing I look for), with a stainless-steel drain tray and a sink. The fridge is half-size and sits under the cook-top and griller. The cooker has only two-hobs and there is a separate grill but no oven. There is, however, set at head height above the bench, a smallish microwave. I liked the bathroom where there is a hand basin of a size you can actually get your hands into. It’s roomy too because the basin folds up when not in use. The toilet is a Thetford. 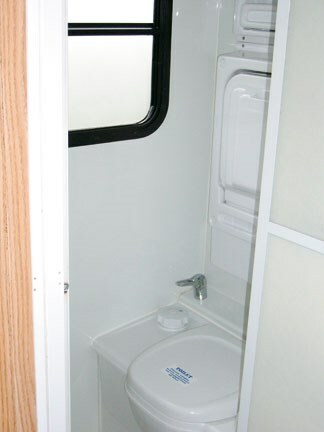 The shower is a pull-out-and-fix type and there is a sizeable toiletries cabinet. The bathroom is ventilated by way of a quite large side-window. On the outside of the vehicle there is no attached awning. Bull bars have been fitted front and back, and the paintwork, though it may not have been original, looked in pretty good condition. We would call this a roomy no-frills, functional motorhome, which would be comfortable for longer stays and would provide its owners with everything they need. Pacific Horizon gives a three-year 300,000 kilometre warranty on the home section of these vehicles. Footnote: Motorhome Caravans and Destinations magazine does not accept responsibility for the failure of this product to perform or for alterations in pricing. This is not intended to be definitive but to let readers know some of the choices they have if they are heading for the second-hand market.